Online Dating and Honesty: Too Soon for Some Folks? Online dating has been around now for ages, at least in terms of this wonderful place we call the Internet. While online dating surfaced in the late 90’s, it didn’t generally go mainstream until the early to mid 2000’s, mainly because of the sketchiness/uncertainty that came along with the idea of online dating in general. While we have come a long way since then – who hasn’t tried finding love online at this point – it still has it’s stigmas, like admitting to friends and family that you met your significant other online. Feel familiar? Wait until you watch the incredible video via the link below – for some of you currently in relationships that started online (hopefully from LFGdating!) this may really hit home! To me, I would have no problem telling my friends and/or family that I used online dating just because it’s so common now. On top of that, online dating is really just as safe, if not a much safer way to meet people than if you were out in public. I will definitely admit however that I know many friends who have sworn me to secrecy that they even tried online dating, let alone have been in a serious relationship from it. What do you think? Would you admit you met your significant other online, or would you make up a story like the stellar dating video above from “The Meet Cute”? While I think many folks are still a little insecure about admitting they met online, I bet in the next five years that worry will erode away entirely – at least I hope so! 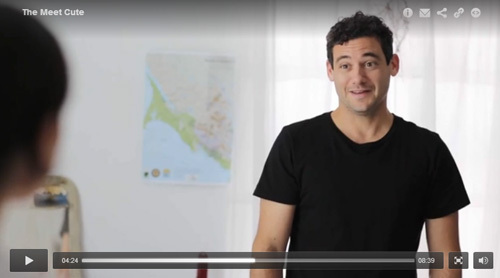 Thanks to The Meet Cute for the great online dating video! If you’re ready to meet your own Player 2, then head on over and register at LFGdating! It’s free to get started, so sign up today!